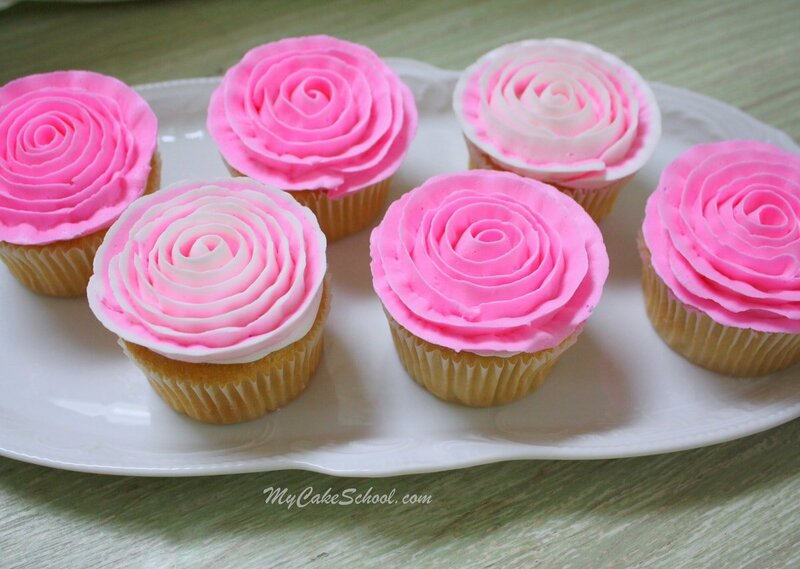 In this super simple minute video, I’m going to demonstrate how to pipe perfect buttercream ribbon roses onto cupcakes! This technique is a great one for all skill levels of cake decorating and is so quick and easy. I love all styles of buttercream roses, but this buttercream rose with it’s continuous spiral feels whimsical and fun. 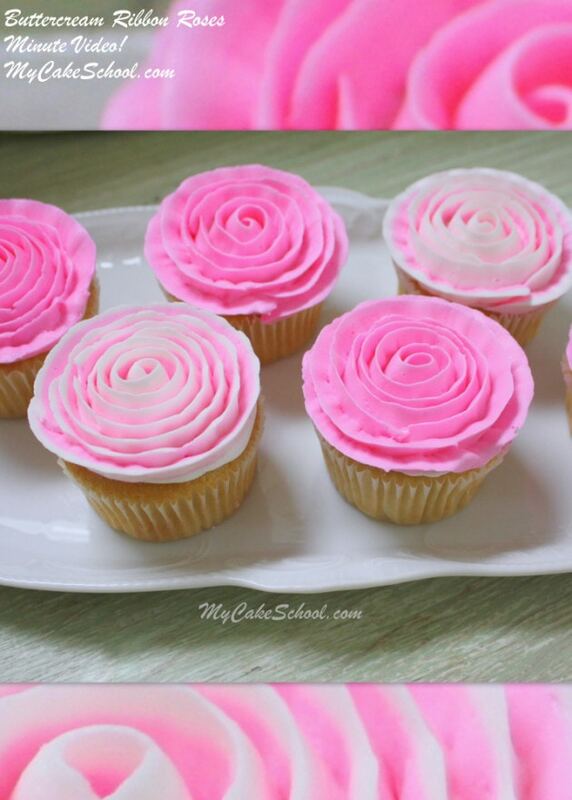 You can vary the look the rose dramatically by the angle of your piping tip. For a true spiral look, simply keep your piping tip perpendicular to the surface of the cupcake (or cake). For a more open look to your petals, rock the petal tip back a bit to a 45 degree angle. You can also create ruffled petals by moving the tip back and forth or up and down as go. So many options! Your buttercream of choice. We used our Fluffy Vanilla Buttercream Recipe. Piping Tips: We used a 12 for the base frosting, and a 104 petal tip for the roses. 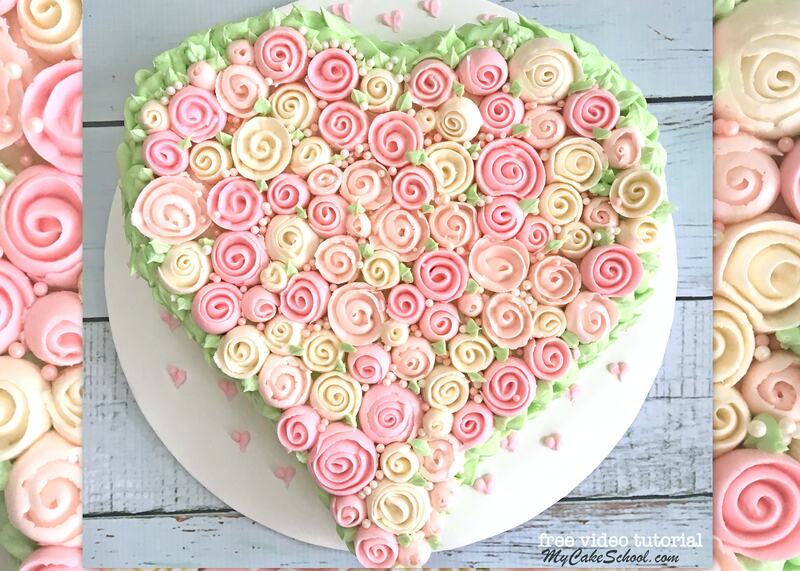 If you enjoyed this buttercream ribbon rose cupcake tutorial, don’t miss our Buttercream Ribbon Roses Heart Cake-Free Video! This free tutorial will show you how to cover a cake in a blanket of ribbon roses! So pretty! Thanks for stopping by! We hope that you’ll come back again soon for more cake and cupcake tutorials & recipes! What’s the best way to stripe a bag? Hi Patricia– You can use a small spatula to spread pink buttercream on one side of the piping bag, and white buttercream on the other side of the bag. Then twist the end of the bag as usual and squeeze until both colors flow from the piping tip. Love it! The cupcakes look great! Lovely. Simple, fast and fun. Perfect for summer!I may let the grandchildren try. Thanks for the video. I love these Melissa! So pretty! Why do you put a base coat down? If your piping like that it seems that you will be covering up any bare cake spots.